Wow! Today is February 7th and another year has passed. I have now completed 18 years total as a monk and I am working on my 19th year. Of course, my monk age is 12 rainy seasons because I changed Nikayas after my 6th year. 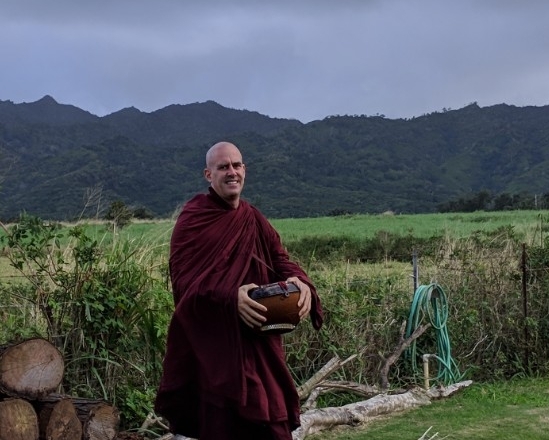 I have been living my monk life in Kauai, Hawaii for about 10 months now and things have been moving along. How long will I stay in Kauai, Hawaii? I’m not sure. To answer that question, the Thai community recently put an offer in on buying some land in Kapahi, Kauai. Land is not cheap in Kauai, but this property fit the bill because it had a blown down unregistered house and a few junk cars lying on its property. It had been abandoned for 20 years and was filled with trees and bush. The good news was that it was already a forest for a very tiny forest monk residence. There were many things to research about the land, but it looked good for us since we had the manpower to clear the land and build on it. However, one of the owners selling the property had died and the land was taken off of the market making our offer dead. The good news was that we were able to go to that point. The bad news is that we don’t know when that property will be put back on the market. In the meantime, I am having fun making lots of merit in Kauai. I have been doing public meditation teachings about a few times per month and I do informal teachings usually on a daily basis because I need help from people everyday. Whenever someone gives me food or a ride, I tell them about the cause and effect related to the gift of energy. I start by asking them if they would like a blessing and most people say “Yes.” This is what I tell them after they give consent. mā te bhavatvantarāyo, sukhī dīghāyuko bhava! may there be no obstacles for you, may you be happy and live long! cattāro dhammā vaḍḍhanti: āyu, vaṇṇo, sukhaṁ, balaṁ. I usually hear a heartfelt “thank you,” after the blessing and it is fulfilling to me. I am a prop for people to make merit, and if I have such an attitude, then I also make merit too. When it is all finished, we are both wondering who is doing who the favor even though we know they helped me out when I was in need. Not only that, I have counted 7 people to date who have cried after I had said this or portions of the loving-kindness sutta. I’m pretty sure there were a couple more too, but I cannot recall all of them and that is why I’m keeping a list now. It always feels really good to my heart when tears come based on the dhamma. Just last week, one lady was moving off the island soon and she asked for a blessing. I told her that normally people give food or rides and they get a blessing because they make their own blessing by doing acts of merit. However, I told her I could give her a teaching on loving-kindness and chant the “Loving-kindness Sutta” for her2. I continued and said that if she puts the teachings into practice, then that would be her real blessing. After I finished chanting, tears were rolling down her face. She explained she had always followed these teachings, but never heard anyone say this to her. My teaching and chant confirmed that she was doing the right thing. It made her so happy and determined that the tears started to roll. The tears were purifying for her too. I make merit by being in Hawaii. Every so often, maybe once per month, profound tears reveal themselves to me. Other times, I get daily sincere “thank-yous” from those who have helped me out. I have also been teaching and you can hear some of the dhamma talks I have recorded at this link here . I know with my heart that I am doing the right thing. I am not wasting my time, even if I were to fly back to Asia today. In other words, I am satisfied and what a great day to express that feeling. May you share in the merit that I have done. sadu sadu sadu.. bhante may you find strength and courage to continue your battle for years to come.until you find nibbana.